You know what, we have done so many reviews on indoor sports equipment that we seldom remember outdoor equipment such as the Ancheer Power Plus Electric Mountain Bike With 26” Wheel. Outdoor sports are the old way of working out until workout equipment is revolutionized such that anyone can work out and achieve maximum physical fitness in the comfort of his home without stepping out of the room. In as much as that is true, there is also no denying the fact that there is an advantage in outdoor sports such as being able to feel and breathe fresh air and view beautiful terrain as well. You know, get together with friends and family and kind of compete with each other which serves as a motivation to working out. Aside from the typical working out and achieving physical fitness, there is also the need to use bikes as a means of transportation which is also good for our health. 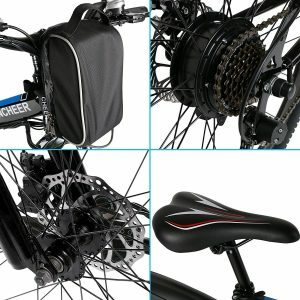 On that note, we decided to review the Ancheer Power Plus Folding Electric Mountain Bike With 26’’ Wheel. This bike is one compact and durable mountain bike given the fact it is produced with aluminum alloy and carbon steel. It has got a couple of interesting features that make it enjoy the popularity among its consumers. More interestingly, it can be ridden with little effort pedaling or no effort at all when it is in pedal assist or E-bike mode, so it is not all about exercise it is also about having fun cruising. Therefore, it doesn’t matter if you wish to buy this bike for achieving physical fitness or just to have it as a way of cruising around easily or camping, even though here in How To Build That Body, we value and emphasizes on good physical fitness, you will still achieve some degree of fitness anyway, however it all depends on how you depend on the E-bike and Assisted pedaling while using it. This is an E-Bike that is light and durable because of its aluminum alloy and carbon steel built. The front fork is made up of carbon steel comfort shock absorption which makes it be great for any kind of terrain. It has got aluminum alloy seat tube. It has got Smart Lithium Battery Charger that charges faster within 4 to 6 hours. It has a large capacity lithium battery (36V/8AH) that supports 25km/15.5 mile when it is in E-Bike mode and 50 km/31 miles when it is in assisted mode. It has 26’’ ultra strong bead spoke wheels that are made up of aluminum alloy and thick anti slip resistant tire that could run through snowy or rainy mountain way with ease. It has 21-speed Shimano professional transmission system with climbing ability. It is designed with a rear brake with dual disc and mechanical front. As you may have already known that it has 2 working modes which are the E-bike and assisted pedaling. It has got a meter with 3-speed smart buttons; Press the M key for 2 seconds to have it turn on/off and it default level value is ‘’low’’. Then, press the ‘’+’’ button to increase the pedal assist level from low, to mid or high which is the maximum level that will provide fast speed while pedaling and to decrease speed level you need to press the ‘’-”. And then you have the ‘’-‘’ button that eliminates the three pedal assist level indicators when pressed to enter into pure E-bike mode where you are required to just twist the throttle and you will cruise all the way. The Ancheer Power Plus Folding Electric Mountain Bike With 26’’ Wheel does not take up space during storage due to the fact it is foldable. LED front light and horn are also included. It supports 150kg maximum capacity. It weighs about 27kg/60 pounds. 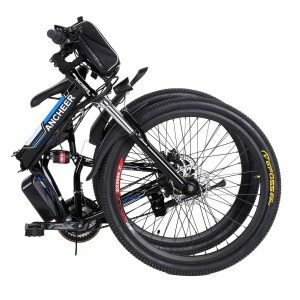 The shipping cost of the Ancheer Power Plus Folding Electric Mountain Bike With 26’’ Wheel is free; that is if you are purchasing from the Amazon, however, that may not be the case with other retailers. Ancheer has offered free assembly service; when you buy this unit make sure you click on the ‘’Select Assembly Preference’’ button. Choose ‘’Ship to store for assembly and pickup’’ or ‘’At home assembly by mobile professional’’. But I guess the latter will cost you some $ therefore if you are not fine with any of that you can have it shipped to you and to be assembled by you. Users that had to assembled it themselves claim to find it a lot easier to put together. Are you looking to work out while you go about your business or do you just prefer and love a ‘’cool’’ outdoor bike to use? Then the Ancheer Power Plus Folding Electric Mountain Bike might just be what you need. A lot of positive reviews have emerged from real users and they are excited about it even though it is a new bike on the market and they just had it for few weeks or months but they are fine with it anyway. If you must purchase make sure you do so from Amazon ( because it is sold directly by Ancheer via Amazon) to avoid unnecessary problems. Moreover, it is available in two colors which are ‘’Black Blue’’ and White Blue’’. Therefore, you may choose your preferred color when purchasing. This E-bike will no doubt appeal to outdoor sports enthusiasts! Can you go faster than 25km in the pedal assist mode of is 25km the fastest it will reach in e bike mode and paws all assist mode? Hello Drew, sorry for the delay in response. The bike can reach 25km/h maximum in E-bike mode to 50km in pedal assisted mode. If you wish to know more about the bike and what other users are saying about their experience with bike please click here (scroll down to the bottom of the page in order to read reviews of real Amazon customers). We will be happy to help you with any other question you may have.